Dogtown and Z-Boys is a love letter dressed in documentary form. It is a letter addressed to skateboarding, the 1970s, youth, and rebellion. The film is a fast-paced ride through the collective memory of skateboarding and the legend of a group of teenagers from Dogtown, a formerly dilapidated oceanfront community in southern California comprised of South Santa Monica, Venice Beach, and Ocean Park. Known as the Z-Boys because they all began as part of the Zephyr Skateboard Team, the group of eleven males and one female helped construct an attitude and lifestyle that continue to resonate in streets and backyards all over the world. I know that yet again ive chosen to write about my travels, but that will change. Venice Beach is really something, Ive had my prejudice thoughts about culture and of the ways people walk and talk in America, some of my thoughts remain but Venice made my brain race, my heart thump quicker and I felt like the place was alive in a form (a creative form) I hadnt seen or experienced in any other part of the world before. I made friends, at least I like to think I did, when I was walking about the boardwalk. There was this skate patch/ skate park where some guys surfed about on their boards. I sat down to observe them (hence I was alone) and two of them approached me after a while. They asked if I lived in the neighbourhood because they hadnt seen me before, I told them why I was in Los Angeles etc. One of the guys was called Joey, he was wearing shorts, clumsy skate shoes and a thick wolly hat, oh and shades as well. The other guy, David, wore a regular t-shirt, shorts and a very nice afro-cut-hairstyle. The two were very tanned... and stoned I gradually figured out. I tried out their boards, felt really silly, but I could see the joy at being good at it, especially if you would live in Venice B. all the flat, smooth and sandy surfaces to skate on, the hot sun making you warm to the bone and the friendly bastards making you feel part of their world. 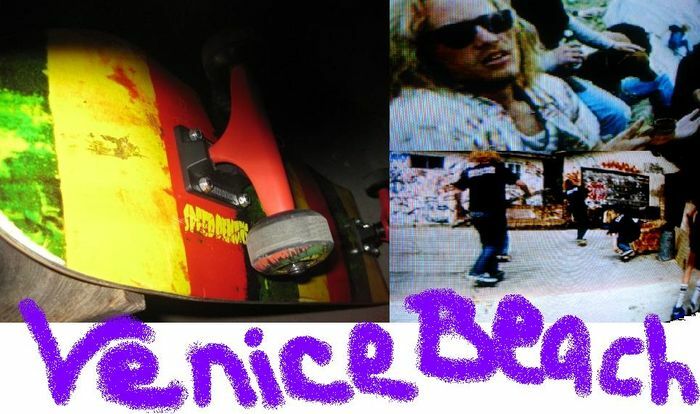 I bought a board, the rastafari one to the left.. the other pics are from Lords of dogtown, the text above is from the first film/documentary about the skaters, havent seen it but you can rent it at the library, I just posted the summary because i find the content interesting. I was inspired to write about this whole matter partially due to the great film "Lords of Dogtown" and partly because I saw one of the lead actors on a surfers beach in Malibu, John Robinson aka Lords of Dogtown's Stacey Peralta. Right... I flew to Jamaica and thought that the vibe over there was good, better than good, great. I ate breadfruit, listentened to rasta tunes and endured the workload that I was there to workout ( filming this program for Swedish TV). I also picked-up some of the language, I reckon it's great fun so why not learn some?